Multiple CT scans in childhood can triple the risk of developing brain cancer or leukaemia, a study suggests. The Newcastle University-led team examined the NHS medical records of almost 180,000 young patients. But writing in The Lancet the authors emphasised that the benefits of the scans usually outweighed the risks. They said the study underlined the fact the scans should only be used when necessary and that ways of cutting their radiation should be pursued. During a CT (computerised tomography) scan, an X-ray tube rotates around the patient's body to produce detailed images of internal organs and other parts of the body. 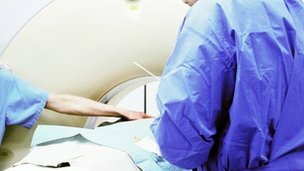 In the first long-term study of its kind, the researchers looked at the records of patients aged under 21 who had CT scans at a range of British hospitals between 1985 and 2002. Because radiation-related cancer takes time to develop, they examined data on cancer cases and mortality up until 2009. Brain cancer and leukaemia are rare diseases. 'Significant increases' The study estimated that the increased risk translated into one extra case of leukaemia and one extra brain tumour among 10,000 CT head scans of children aged under ten. Dr Mark Pearce, an epidemiologist from Newcastle University who led the study, said: "We found significant increases in the risk of leukaemia and brain tumours, following CT in childhood and young adulthood. "The immediate benefits of CT outweigh the risks in many settings. "Doses have come down dramatically over time - but we need to do more to reduce them. This should be a priority for the clinical community and manufacturers." CT scans are useful for children because anaesthesia and sedation are not required. This type of check is often ordered after serious accidents, to look for internal injuries, and for finding out more about possible lung disease. Regulations on their use in the UK mean CT scans should only be done when clinically justified - and the researchers said their study underlined that point. Professor Sir Alan Craft, a co-author and leading expert in child health, said: "The important thing is that parents can be reassured that if a doctor in the UK suggests a child should have a CT scan, the radiation and cancer risks will have been taken into account. "There's a much greater risk of not doing a CT scan when it's suggested. "This study will push us to be even more circumspect about using it. We have much stricter rules here about using CT than in the United States, for example." Dr Hilary Cass, the president of the Royal College of Paediatrics and Child Health, said: "We have to take very seriously the link between repeated CT scans and increased risk of these cancers amongst children and young people. "But with both tumours rare, the absolute risk remains low." A Department of Health spokesman said: "The UK uses lower levels of radiation in CT scans than other countries. "We also have clear regulations to ensure a CT scan is only carried out when clinically justified."